With only three weeks to go till we leave Beijing, we’re hurrying to do all the things we haven’t yet done here. And somehow, we never got round to going to a Beijing Guo’an football match. Back home, I was a regular attendee at Birmingham City games (and anybody with any knowledge of English football will tell you what an act of long-suffering devotion that is…) The realization that I haven’t taken my boys to a match for three years came as something of a shock to me, and when they told me that their last memory of going to a football game was Birmingham losing six-nil (that means we scored no goals) in a snowstorm, it was clear that something had to be done. 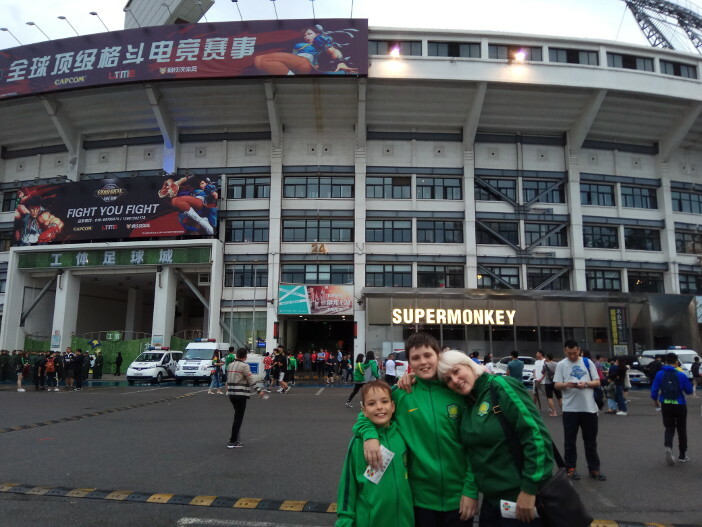 So we headed out on a bright Saturday afternoon to go to see Guo’an play their fierce rivals Shanghai in a cup game. It was already lively around the Workers’ Stadium, with stalls setting up, but the venue itself seemed to be still closed. We went and asked when the game started, and discovered that I had got the kick-off time from a US website, and we were six hours early. Undeterred, we went to visit the Urban Planning Museum (which was more fun that it sounds, honest), then for something to eat. First though we made sure to get our tickets. The only official way to buy tickets for Chinese Super League matches is to order them days in advance, from a Chinese-only website, and wait for them to be delivered to you. So we did what most people do, which was to buy from a scalper outside the stadium. I’d had previous experience of dealing with ticket touts in Beijing, at the NCPA, and it’s fairly safe on the whole. They’re usually selling freebies or discounted tickets which were given to someone else, and generally take face value for decent seats. We haggled a little, but it was too early in the day for a real bargain. If you wait till close to kick-off, then you can push the price down, but we decided to play safe. Nonetheless walking away got us a small reduction, and we ended up paying RMB 800 for four tickets. Not a cheap day out with a family, but substantially less than you’d pay for an English Premier League match. When we returned to the ground, the crowds were gathering. There’s nothing quite like the feeling of walking towards a stadium before a big game, with thousands all heading the same way with the same purpose, and the excitement building. The rainclouds were also building, so we ended up buying Guo’an tracksuit tops to keep warm. Matching leisure wear is not generally how we roll as a family, but we wore the green of our adopted team with pride. We timed our arrival perfectly, entering just as the teams walked out onto the pitch. It was no surprise to find people in our seats. Cup games often attract occasional fans (like us) who don’t know their way around. However everything got sorted in time for the referee’s whistle, and the game was underway. In any case watching football on a screen bears no resemblance to the experience of being there, the noise, the flags, the colors and the songs. And in our match there was no shortage of action. Guo’an took the lead, but Shanghai equalized from a free kick. As the minutes ticked down I began to wonder whether extra time was played in Chinese cup games. But a Guo’an forward tumbled in the penalty area under pressure from a defender. Initially the referee waved away protests, but then signaled that he was going to review video evidence. This is a new development in soccer which I had never seen before. He ran to the side of the pitch where there was a big-screen TV, and watched replays of the incident. Then he turned and pointed to the penalty spot, and the crowd went wild. Guo’an regained the lead, but the drama was not over. In the last seconds of the match a Shanghai player went down in the area, and when no penalty was awarded their players (and fans) were furiously indignant that there was no video review. At last the final whistle went, and Guo’an were victorious. 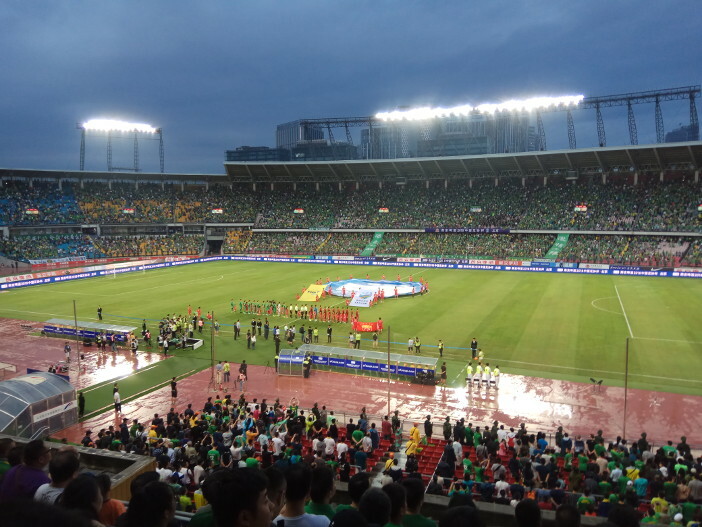 Even if you’re not a fan of the “Beautiful Game” a Guo’an match is an entertaining day out. In fact, my kids proclaimed it possibly the most fun day we’d had in our three years in the city. So at least we’re going out with a bang.